Good question. In short, plants have serious issues with getting eaten and so they fight back by making themselves unappetizing in various ways. Animals need a special arsenal to survive on raw plant material, especially if it is mainly leaves and grasses. The plants' defensive efforts are considerable and contribute to the large size of grazing and browsing mammals, which we'll examine in this post. The second reason that herbivorous mammals are so large is less apparent: plant-eating mammals typically house a big, strong, complex digestive system to break down plant matter. Their teeth, jaws, and digestive tracts have evolved to allow them to obtain nutrients from plant tissue, which is often tough, fibrous, and bitter, especially leaves and grasses. Why are plants so tough to process? Plants convert sunlight into food through their leaves (through photosynthesis). When their leaves and stems are eaten, they produce less energy, which restricts their growth and lowers their fitness, so they do their best to avoid it. 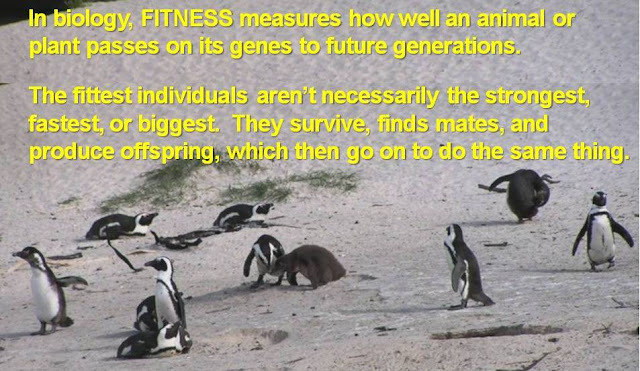 They can’t run away from an animal wanting to eat them, so they rely on other defenses to maintain their fitness. Plants have evolved numerous defenses, such as thorns and spines, tough shells on their seeds (think coconuts! ), and bitter or toxic chemicals to avoid predation by herbivores. 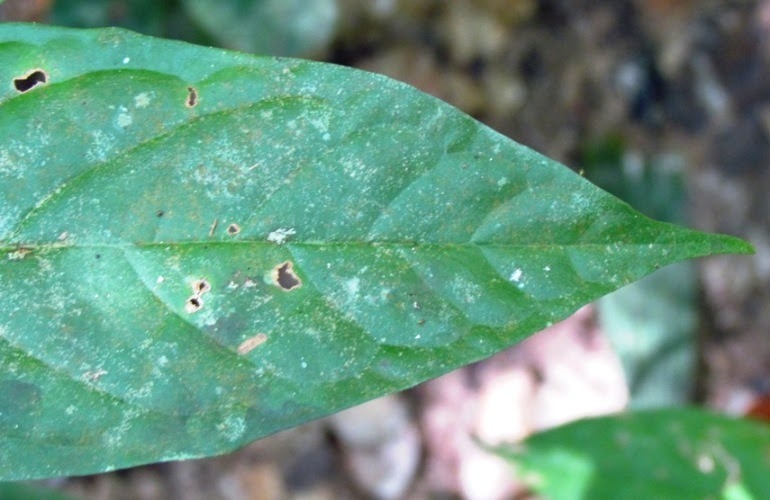 We humans need to heed plant defenses as much as herbivores. 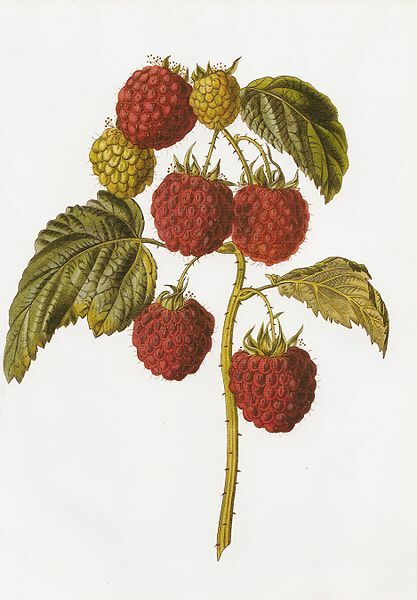 If you've felt the sting of raspberry thorns as you try to pick the berries, or the itchy rash of poison ivy from a brief touch of the leaves, you know what I mean! Nicotine (in tobacco leaves) and cocaine (in coca plants) are also among the thousands of plant chemical defense compounds that scientists have identified (Coley & Barone 1996, see below). Even that astringent taste of unripe fruit that makes you pucker has a purpose -- to keep you and other animals from eating them while the seed is still developing. In the case of leaves, these chemicals develop over time, so folivores, the herbivores that eat mainly leaves and stems, prefer to eat a plant's new leaves that are the most tender and least toxic. Over time, plants with chemicals or physical structures that keep animals from eating them save energy, produce more food, and are more likely to survive than those that lose their leaves! 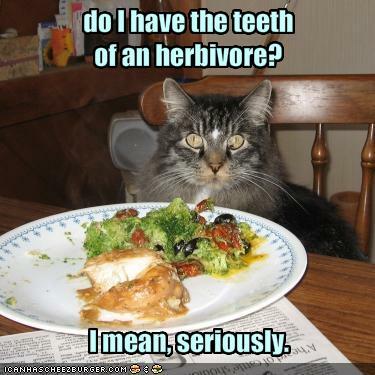 How can herbivores eat such nasty food? Herbivores, in turn, have evolved physical and chemical adaptations to both find and eat plant foods that are most nutritious and least toxic. One strategy for folivores is to eat younger leaves (top photo, left), which contain more protein, less hard-to-digest cellulose, and fewer toxic compounds than mature leaves (bottom photo). 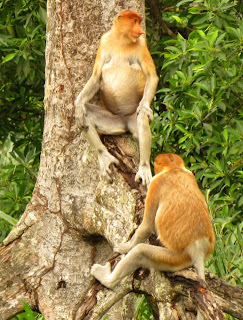 Some animals also have keen senses of smell that can detect bitter compounds in leaves, which they can then avoid. Cool note: some butterflies and other insects can "taste" a plant through chemical sensors in their feet before they actually eat it. Carnivores, which kill and eat other animals, usually have long, sharp teeth that help them grab prey and are needed for biting and tearing flesh. 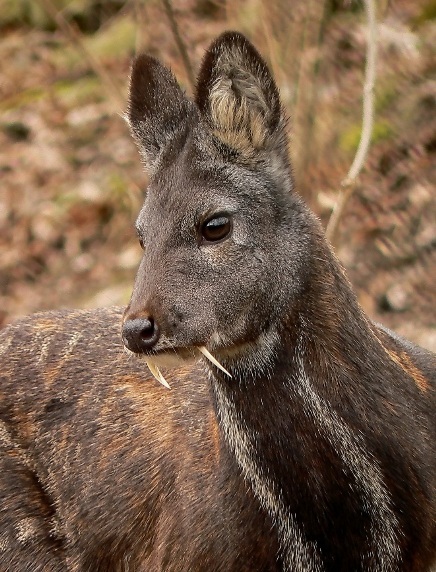 Many herbivorous mammals, on the other hand, have large, flat molars that allow them to grind up and break down the tough cell walls found in leaves and grasses. The teeth of grazing animals also have high crowns, which helps them last over years of having to chew up soil minerals and grit that get mixed in with each mouthful of grass. However, some herbivores also have long, sharp teeth. These teeth, such as those on hippopotamuses and gorillas, are not adapted for eating. They have developed for confrontations with other animals - fighting, not feeding. 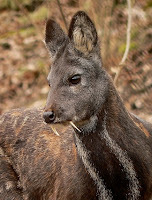 The musk deer is a perfect example. Only males have these crazy tusks, which are teeth that they use to fight other males for mates (they have no antlers). Herbivores don't kill prey for food, but teeth like these have evolved to defend their owners against predators and potential competitors. You'll recognize the most obvious characteristics of the folivorous mammals -- their big bellies. Not that they are fat! No sir. They are just big-boned digesting. Animals that eat nuts, seeds, and fruit -- the most nutritious parts of plants -- can get away with eating a modest amount, but folivores eat grass blades, leaves, stems, and even bark. Although grasses and leaves are easier to access than small prey animals, insects, or even ripe fruits, they are hard to digest and not highly nutritious. These parts of plants are low in fat, protein, and energy, so folivorous animals spend much more time grazing and browsing than meat-eaters like dogs, tigers, weasels, or eagles do hunting. Those long hours of continuous eating are not only possible, they're necessary for the animal to stay healthy. Elephants apparently need to eat up to 135 kilos (300 lbs) per day, while gorillas eat up to 27 kilos (60 lbs) per day. Remember all those chemicals that plants produce to minimize leaf damage? Here's where they come in. Grazing animals usually need to ferment their food in order to digest it. Fermentation takes time and energy and creative gastrointestinal design, so these species have big, complicated digestive systems that can store and process large quantities of plant material into digestible food. As a result of the fermentation and other leaf/grass processing, the bellies of grazers and browsers are actually full of leaves and gas (methane is a big one), which they belch regularly to release. ** Apparently cattle produce nearly 20% of all methane emissions into the atmosphere -- good reason to avoid eating beef. Herbivores are separated into two groups, based on where they break down and ferment food particles prior to their absorption. Fermentation and digestion happens in stomachs of foregut fermenters and in the intestines of hindgut fermenters. The many species of grazing cattle, sheep, and antelope, as well as browsers such as deer and giraffes, do most of their digestion in their stomachs, which are divided into four chambers. Fermentation (methane production) in progress! Stomachs are important, but four? Each one contributes to either physically or chemically breaking down plant material or to absorbing nutrients from the resulting mix. The first chamber is called the rumen, from which comes the word ruminants, animals that eat plants and digest them through this specialized multi-chambered stomach! The average rumen can hold around 160 liters (40 gallons). The food is so tough, that ruminants partially regurgitate the particularly tough bits to chew them again, which is what you see if you watch cows, sheep, goats, antelope, and even some kangaroos chew their cud (or "ruminate"). Moreover, they have a lot of help. Like humans, herbivorous mammals have numerous bacteria and other microbes in their guts that help them digest food. But microbes (mostly bacteria plus some protozoa, fungi and yeast) living in an herbivore's gut help break down cellulose, which the animals can't do themselves. Cellulose is the large molecule that forms the tough cell walls of plants. It makes many grasses stiff and able to stand upright, as well as inedible to mortal humans. The ruminant's gut bacteria break down the cellulose and allow cows and other grazers to grow big and healthy on a grass diet. The design must be effective, because camels and their cousins the llama and alpaca, as well as colobus monkeys, have separately developed 3-chambered stomachs to do the same thing. In horses, rhinos, tapirs, koalas, rabbits, and a whole suite of other herbivores, digestion takes a completely different approach. Here, the fermentation takes place in a jumbo-sized large intestine, which contains fermenting bacteria, so it acts like the first two chambers of the ruminant stomach. So these animals don't regurgitate half-chewed food -- their food processing starts in the stomach but starts fermenting after leaving the stomach. It is quicker but less efficient than ruminating, so these animals keep eating to push more food through their digestive tract. 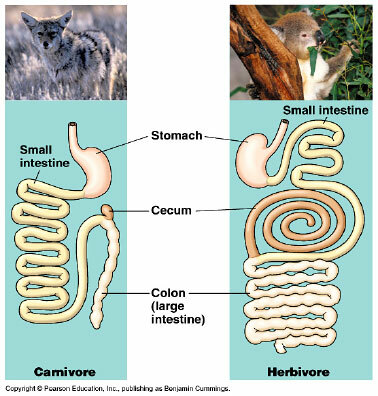 Consider the difference in intestine length between a carnivorous wolf and an herbivorous (hindgut fermenting) koala. which foods need more internal processing: meat or plants? Leaves and grass ==> low concentrations of nutrients & high concentrations of fiber and chemicals ==> high digestive effort to break down and digest ==> big bellies and long hours of chewing and digesting. does this stripe pattern make me look fat? Although you and I would probably not survive on a diet of raw greens -- we lack the microbes and the digestive setup and power of a true herbivore -- we humans can thrive on a plant-based diet because we've learned to cook food. This ability has diversified human diets so that they can focus on plants, meat, fish, fruit, or all of the above. Nature magazine online compares predators of all types (including plant predators). Here's more on how how mammalian herbivores digest toxic foods. Have a look at this BBC video of a 3-toed sloth climbing and feeding on particularly tough, toxic leaves. And for everything you ever wanted to learn about and compare in the digestive systems of all types of vertebrates, try this page from the Comparative Nutrition Society. Wikipedia has a great review of plant defenses against herbivores. For more depth, this scientific article about herbivorous animals (big and small) and plants' defenses in tropical forests is cited by many of the other sites: Coley, P. D. & Barone J. A. 1996. Herbivory and plant defenses in tropical forests.Annual Review of Ecology and Systematics 27, p.305-335. To know more about how plants turn sunlight into energy for growth and food for herbivores? 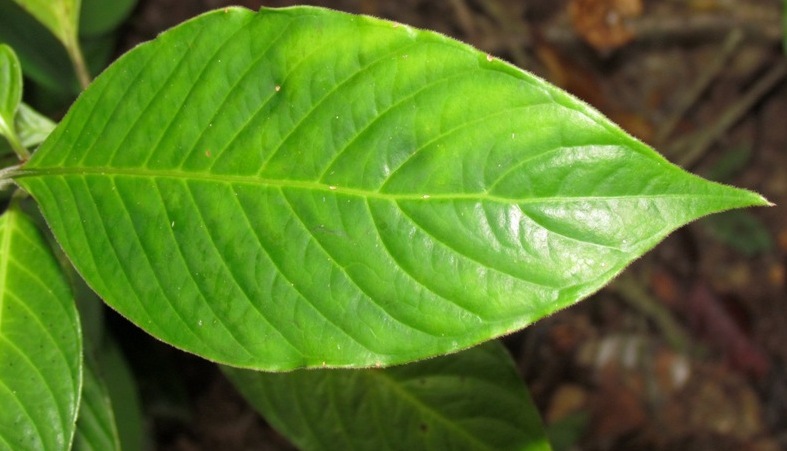 Try Wikipedia's super-detailed photosynthesis page. Michael Breed's online Animal Behavior book. **The average dairy cow expels 100-200 liters (25-50 gallons) of methane each day, and possibly more, making them a major source of methane pollution. The pic of the zebra and the giraffe is really a nice one. I wonder if your readers are aware that it is a very special zebra - a Grevy's zebra! Those fine stripes make it quite dashing! I didn't mention it, but you are right! 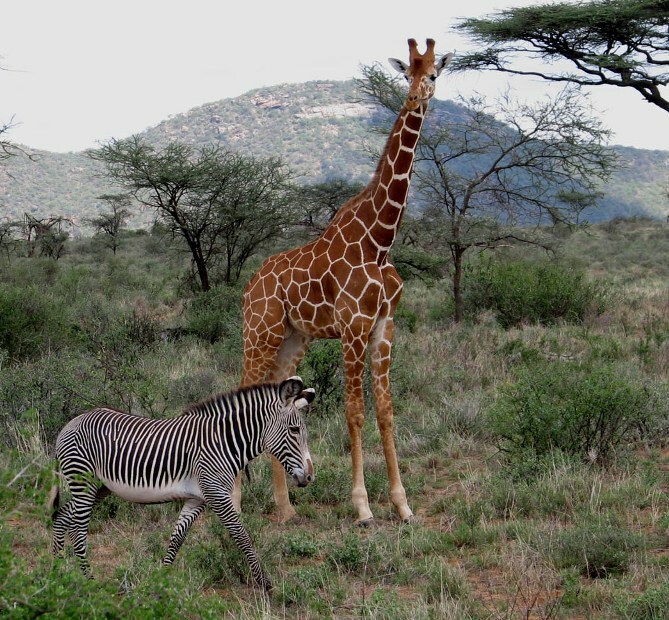 Grevy's zebra lives in the drier environments of northern Kenya and Ethiopia, so you won't see it in the well-known Masaai Mara or Serengeti plains. I love this photo! the amount of information in this article is truly wonderful. i just wish it wasn't so focused on "bullying" these herbivores and calling the food less nutritious. these are very special creatures, they don't derive pleasure out of ripping the flesh off another's bones like the carnivores. they are peaceful. i think that speaks volumes about the "nutritiousness" of their diets.